To make an enquiry – Go online: www.enquire2.com Send a fax: 01952 234003 or post our: Free Reader Enquiry Card INSULATION & ACOUSTICS // 81 liquid water and are ideal for use in conjunction with the rain-screen cladding system specified. Closed cell foams also have a greater thermal resistance than open cell foams. Cost efficient solution Icynene MDC-200 foam insulation was applied to the entire outer leaf of the games hall, an area of approximately 550 sqm and to a thickness of 150mm. The work was completed over a four-day period. According to Icynene, spray applied insulation is broadly comparable in cost to conventional fibre based and rigid board type insulation materials however, its speed of installation, minimal waste and its ability to perform in difficult to treat applications means spray foam can be an extremely cost-effective solution for a variety of projects up to and including those built to Passivhaus standards. Construction of the Baptist Church buildings began in early 2017 and is scheduled for completion by Easter, 2018. Icynene – Enquiry 100 The complex latticework of steel frame for the cladding made it extremely difficult to install conventional rigid board insulation. 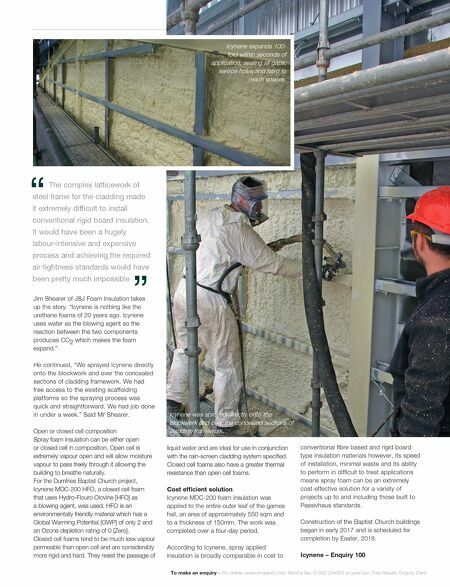 It would have been a hugely labour-intensive and expensive process and achieving the required air tightness standards would have been pretty much impossible Jim Shearer of JSJ Foam Insulation takes up the story. "Icynene is nothing like the urethane foams of 20 years ago. Icynene uses water as the blowing agent so the reaction between the two components produces CO 2 which makes the foam expand." He continued, "We sprayed Icynene directly onto the blockwork and over the concealed sections of cladding framework. We had free access to the existing scaffolding platforms so the spraying process was quick and straightforward. We had job done in under a week." Said Mr Shearer. Open or closed cell composition Spray foam insulation can be either open or closed cell in composition. Open cell is extremely vapour open and will allow moisture vapour to pass freely through it allowing the building to breathe naturally. 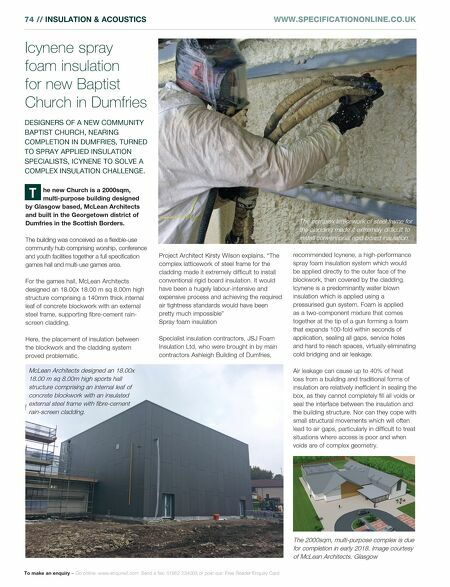 For the Dumfries Baptist Church project, Icynene MDC-200 HFO, a closed cell foam that uses Hydro-Flouro Olovine [HFO] as a blowing agent, was used. HFO is an environmentally friendly material which has a Global Warming Potential [GWP] of only 2 and an Ozone depletion rating of 0 [Zero]. Closed cell foams tend to be much less vapour permeable than open cell and are considerably more rigid and hard. They resist the passage of Icynene was sprayed directly onto the blockwork and over the concealed sections of cladding framework. Icynene expands 100- fold within seconds of application, sealing all gaps, service holes and hard to reach spaces.